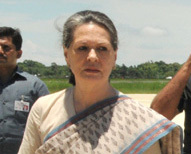 Congress President Sonia Gandhi on Friday directed all party MPs and MLAs to donate their one month salary for relief work in the flood-ravaged Uttarakhand as the magnitude of the flash flood tragedy continued to unfold taking the death toll in the rain fury to 207. Gandhi also directed all party MPs from Lok Sabha and Rajya Sabha to give Rs 10 lakh each from their MPLAD fund for carrying out relief work there,” party’s communication department in-charge Ajay Maken said. Congress has currently 203 members in the Lok Sabha and 72 in Rajya Sabha. The party has also set up a PCC control room at Dehradun to accelerate the relief work. AICC Secretary Sanjay Kapoor and the party’s wing Seva Dal’s chief Mahendra Joshi have been sent to Dehradun to monitor the work. “All PCC chiefs are being asked to send all the relief materials from their states to Uttarakhand immediately,” Maken said. Rawat, who had visited the Kedarnath area, said that he spent five hours there and was shocked to see the extent of the damage caused to the buildings and area adjoining the shrine.